Corby Social Group – 4th Tuesday of the month from 2pm -4pm. Held at Swan Gardens, School Place off Gainsborough Road. Click here for dates. Long Buckby Social Group – 3rd Thursday of the month from 11am-3pm. Held at Greenhill Court, Park Road (includes Lunch). Click here for dates. 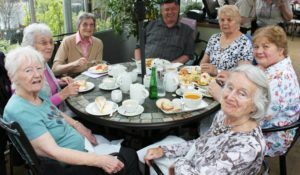 Northampton Luncheon Club – 3rd Tuesday of the month from 12:45-3:30pm. Held at Delapre Community Centre, Alton Street. Click here for dates. Northampton Pub Lunch – 1st Tuesday of the month from 12pm – 3pm. Meet at The Trumpet Public House, Wellingborough Road. Click here for dates. Wellingborough Social Club -3rd Thursday of the month from 1:30pm-3:30pm. Held at Knights Court, Gold Street. Click here for dates. We also have groups run by Our Branches in: Brackley, Kettering, Oundle, Rushden and Towcester. Visit our Events Calendar to find out when and where our Social Groups meet or call our Helpline: 01604 719193.